Every human being is unique and different in their own ways. Keeping this fact in mind the company has developed a comprehensive range of products with customized technology to meet the needs and requirements of each and every individual. 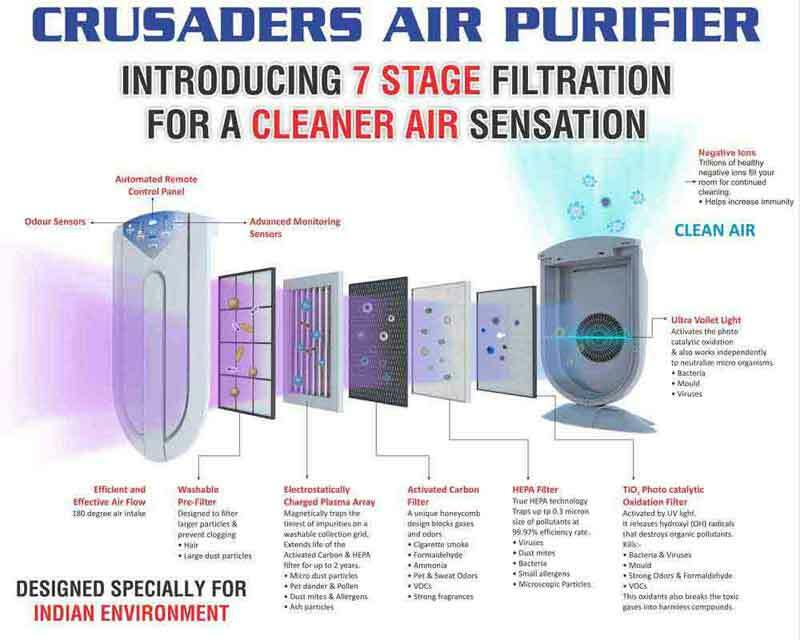 We used best-in-class 7 Stage Filtration technology. The air filters used are highly efficient and controls over 99.97% of air borne pollutants like dust mites, bacteria & viruses, germs, pollen and many more. Each filter has a specified role to play and ensures that the air you breathe is pure and fresh!! It’s a fine mesh, washable filter that filters out larger dust particles, small insects found in the air, pet danders and human hairs. This filter works by producing an electric charge which is passed through the wires fitted into this filter. It generates electro-magnetic flux on the metal plate and help attract pollutants like dust mites, light dust particles, pollen grains, allergens etc to stick onto the washable metal plate. This filter is made up of light charcoal granules. Here the property of charcoal known as ADSORBTION is used to absorb and neutralize the problems like smoke, odour, formaldehyde, ammonia and VOC. HEPA filters are composed of a mat of systematically arranged fiber, composed of fiberglass. HEPA filters, by definition, removes at least 99.97% of airborne particles of size 0.3 micrometers (µm) in diameter. HEPA filters are critical in the prevention of the spread of airborne bacterial and viral organisms and, therefore, infection. Photo-catalytic oxidation (PCO) is achieved when you combine UV light rays with a TiO2 coated filter. This process creates hydroxyl radicals and super-oxide ions, which are highly reactive electrons. These highly reactive electrons aggressively combine with other elements in the air and sterilizes bacteria and viruses caught by HEPA, VOCs (Volatile Organic Compounds) , harmful pollutants such as formaldehyde , ammonia and many other common contaminates released by building materials and household cleaners generally found in the home. Once bound together, the chemical reaction takes place between the super-charged ion and the pollutant, effectively "oxidizing" (or burning) the pollutant. This breaks the pollutant down into harmless carbon dioxide and water molecules, making the air more purified. Negative ions are odorless, tasteless, and invisible molecules that we inhale in abundance in certain environments like mountains, waterfalls, and beaches. Negative ions help freshen and purify the air by causing allergens such as pollen, mold spores, dust, and animal dander floating in the air (which have either a neutral or a positive charge) to be attracted to and stick to each other, forming 'clumps'. These clumps of particles then become heavy enough so that AIR PURIFIER can pull them inside, where they can be filtered, rather than staying in suspension where they can be breathed in and cause allergic reactions. Built in air quality sensors that monitors the air quality of your room and automatically adjusts it as per your needs. Uses nature’s phenomenon to refresh the air with zero emission of harmful chemicals or ozones that can cause ill effects to your health. Designed as per customized needs of customers. Ultra silent speed for use at night so that you can enjoy a relaxed sleep. Washable and easy to clean filters with longer shelf life. Also give you alerts when filter needs to be replaced. The indigenous technology used in our products are developed and tested over years in Indian pollution scenario and the results are outstanding. The company is continuously striving to achieve the goal of providing a pollutant free environment to our customers.